In Legend of Korra, an enormous metal statue is located on a small island off the shores of Republic City. It depicts a teenage Aang dressed in traditional Air Nomad attire. 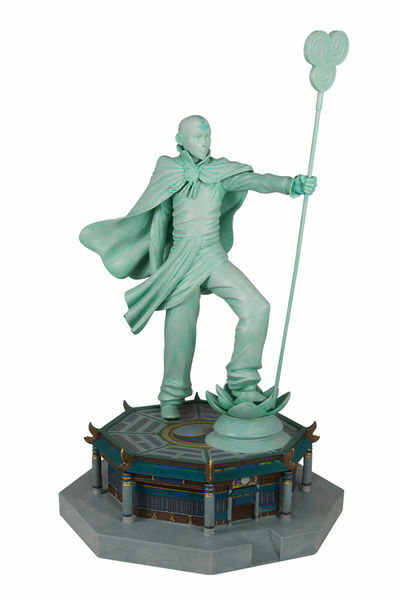 In the figure's left hand is a staff featuring the airbending symbol on its upper end. The figure's left foot rests on a slightly higher surface in the form of a lotus flower. The pedestal on which its other foot stands is octagonal in shape, with upturned tips at each vertex surrounded by railings. Dark Horse Deluxe, in coordination with Nickelodeon and the Avatar and Korra creators, has exactingly reproduced this piece as a hand-painted limited-edition collectable. Edition size TBD at press time. Legal Notice: Entire contents trademarked (® or TM) and copyrighted (©) 1986-2019 by Things From Another World, Inc. and respective copyright and trademark holders. All rights reserved. Page rendered at 2019-04-25 01:36:33 in 0.255 seconds.